Do you love the Lake District? Do you enjoy walking or simply gazing at Cumbria’s stunning mountain landscape? Then VOTE for Nurture Lakeland and Fix the Fells in the Community Choices competition and help us protect the timeless beauty of Lakeland’s highest peak – Scafell Pike. Nurture Lakeland, in partnership with Fix the Fells, are a finalist in the Community Choices competition. Our project Save Scafell Pike is asking for £8,000 to carry out vital repair work on England’s highest – and most iconic – mountain. The 978-metre summit is much-loved by locals and tourists alike. But sadly the pounding of thousands of pairs of hiking boots every year has eroded the mountain, leaving behind ugly scars and deep gullies. It is in dire need of repair. Vote for Nurture Lakeland and Fix the Fells and we will use the £8,000 grant to carry out vital repair work to the Brown Tongue path to the summit of Scafell Pike. We will transport stone materials to the site by helicopter (the only way to do it, due to the remote location) and then rebuild the path, fix drains and re-landscape erosion. Please give us your support and help ‘Save Scafell Pike’. 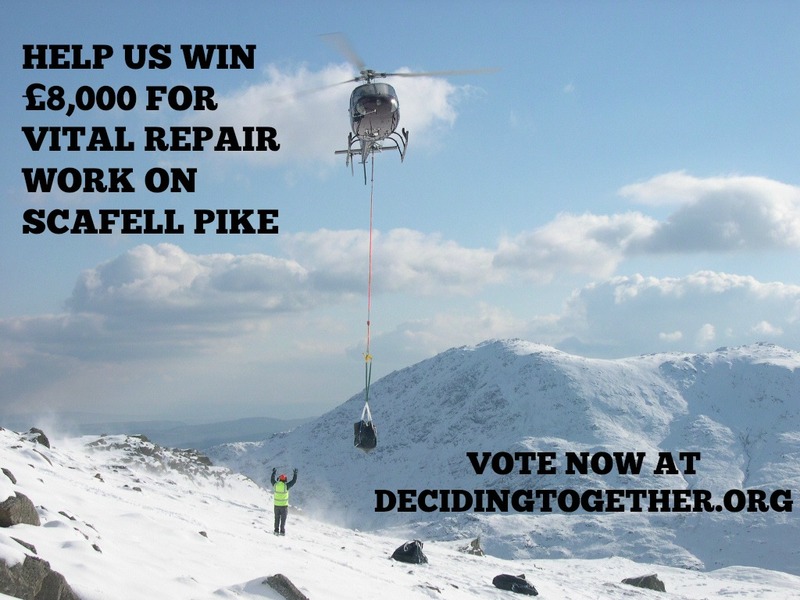 Then vote for our project – Save Scafell Pike in the “Improving Cumbria” category. You can cast 10 votes all in one go – so please choose us 10 times!